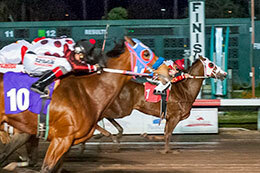 Zoomin For Spuds, under jockey Jesus Ayala, drives to victory in the Grade 1 $157,200 Brad McKinzie Winter Championship Sunday night at Los Alamitos Race Course. 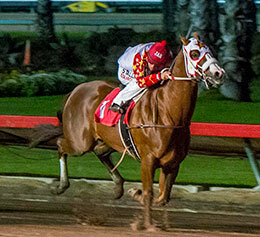 LOS ALAMITOS, CA—FEBRUARY 10, 2019—Jim Walker’s homebred Zoomin For Spuds became the fifth horse to qualify four or more times to the prestigious Champion of Champions after scoring a wire-to-wire victory in Sunday’s Grade 1, $157,200 Brad McKinzie Los Alamitos Winter Championship at 400 yards. Ridden by Jesus Rios Ayala for trainer Monty Arrossa from post number one, the 6-5 favorite Zoomin For Spuds beat the 11-1 shot Eyes The Favorite by a head while covering the 400 yards in :19.50 over a wet fast track. "He liked the post position number one," Rios Ayala said. "It was a bit slippery down there, but the horse ran his race. He’s always fast at the break, but in the final yards I started feeling that the horses on the outside were getting closer. But my horse never stopped, never lost his rhythm. I didn’t see the other horses. Not until the end did I see the horses from the outside. He came back great. He galloped back nicely. He ran a great race." Zoomin For Spuds joins five-time Champion of Champion finalists Refrigerator and Jess You And I plus four-time finalists Whosleavingwho and Heza Dasha Fire as the only horses to have qualified four or more times to the Champion of Champions. All five of these horses have won the Champion of Champions at least once, with Zoomin For Spuds winning the 2016 edition during his 3-year-old campaign. The now 6-year-old gelding finished third in the 2017 running and was fourth to AQHA World Champion Bodacious Eagle in the 2018 renewal. The 2019 edition of the Grade 1, $600,000 Champion of Champions will be held here on Saturday, December 14. "I was proud to run fourth (in last year’s Champion of Champions)," Arrossa said. "That was a horse race. Those were the best older horses in the country and (Zoomin For Spuds) got outrun a head bob. We could have easily been first or sixth in that race. I was proud of his effort. He bounced back super. He ran big in the trials and came back and ran huge tonight. I’ve had plan up to February 10th. I don’t have a plan for this horse past tonight. We’re going to enjoy this one." 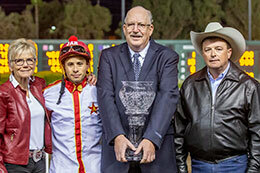 Zoomin For Spuds earned $66,024 for his victory in the Brad McKinzie to take his career earnings to $779,990. The Walker-bred runner improved his record to 14 wins from 37 starts. This was also his 11th career stakes victory at Los Alamitos, making him only the 10th Quarter Horses ever to reach that figure here. 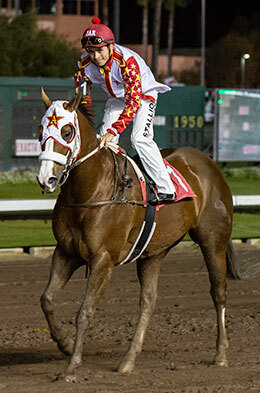 Put it all together and Zoomin For Spuds, an AQHA Supreme Race Horse, has put together quite a career resume at Los Alamitos. The chestnut gelding is by multiple grade 1 sire Zoomin For Bux from the Corona Cocktail mare A Perfect Cocktail. "Jim’s goal with this horse is that he wants to see him win a million dollars," Arrossa said. "My goal has always been to get back in the Champion of Champions. We are there and hopefully we can make that million dollar goal next." Walker has been a key figure in Arrossa’s career for many years. In addition to Zoomin For Spuds, the two have combined to win many other races at Los Alamitos, including the Uncas Handicap with Time For Jesse Lee. "Jim is turning 87 this year, but he’s as sharp as a tack and a goer," Arrossa added. "He’s a health nut. He takes care of himself and eats very healthy. Jim is doing well. Idaho is getting pounded with snow, especially where he lives in Bellevue. The last couple of days when I’ve talked to him, he’s been out on a loader moving snow and chasing elk out of his place. He’s also getting ready to foal out his two mares. He has Zoomin For Spud’s mother (A Perfect Cocktail) who is having a baby by Moonin The Eagle. He also has Zoomin For Spud’s half sister, Doing Trix, who we ran here at Los Alamitos. She’ll be having a baby by Zoomin For Bux. He’s already thinking about what he’s going to breed them to next year. Actually, he’s already looking three years down the road about breeding those mares." In addition to Zoomin For Spuds, Arrossa saddled Katies Easy Moves, who finished third for Caballo Rapido LLC and Five Livestock Company LLC, and Da One Two Special, who lost his best chance after getting bumped at the start, but figures to be a force in the older age division all season long. 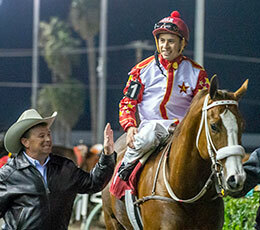 "We had three horses in this race and the same groom, Filiberto Alvarado, takes care of all three," Arrossa added. "Our assistant Jesse Castillo has done a great job. The mantra in the barn this week has been, ‘Relax Monty, relax.’ I’ve been pretty nervous since the trials. Anytime it’s a big race, I’m nervous. That’s just my nature. I think I drive those guys crazy. They’re on top of things. They do a fantastic job. They don’t need me. They can run the thing without me. I don’t know what we’re going to do next with Zoomin For Spuds. We’ll sit back and assess the options. We’ll try to have him peaking around Champion of Champions time." Owned by Lisa Beauprez, Thomas Bradbury, Thomas Bradbury, Jr., and Paul Jones, Eyes The Favorite flew from the outside post 10 to finish second in the Brad McKinzie. Ridden by Carlos Huerta for trainer Paul Jones, Eyes The Favorite earned $26,724 for his effort. The Favorite Cartel gelding was also second in the Grade 2 Southern California Derby in his final start of 2018. Sheryl Edgar bred the Favorite Cartel gelding in California from the Eyesa Special mare Eyesa Painted Bug. He has earned $160,873. Ridden by Eduardo Nicasio, Katies Easy Moves earned $18,864 for running third. The Maknmoves gelding continues to perform well at the top level. In 2018, he was second to BH Lisas Boy in the Grade 1 Bank of America Championship Challenge year and fourth in both the Grade 1 Robert Boniface Los Alamitos Invitational Championship and Grade 1 Vessels Maturity. Katies Easy Moves races for owners' Caballo Rapido LLC and Five Livestock Company LLC. Bred in Utah, by Walther Finder, the 6-year-old is out of Katie Lane Finder by Lanes Leinster. Ed Allred’s He Looks Hot earned $11,004 for running fourth to take his career earnings to $1,213,423.